Being a mama and running my blog single handed can leave me little to no alone time to take care of myself on a regular basis and around the holidays it becomes even harder to carve out a little time to myself with all of the holiday get together's, parties and activities. It's important to me to pencil in some me time one or two nights a week and really focus on self care and love and treat myself to a relaxing and rejuvenating routine. If you are a busy mama or just need a little self care, it's important to take the time to treat yourself once or twice a week. You will feel so much more refreshed and rejuvenated to tackle your week and holiday get together's! I love to start my self care nights by taking a long, warm bubble bath and relaxing in the tub with my phone on Do Not Disturb. It's important to take a break from social media and technology every once in awhile and unplug to just enjoy things in the moment and relax. You can even light candles in the bathroom and dim the lights for super relaxing ambiance. When I get out of the bath, I love to light candles in my room and get into my favorite comfy and cozy pajamas and socks and put on my favorite show to watch. Lately I've been living in cozy over-sized hoodies and sweatpants to relax and stay warm in. If you want to purchase the products I've been using or get more information about them you can actually hover over this picture for direct links to them at CVS! With all of the hectic things I deal with everyday, it's hard for me to stick to a strict skincare routine every night. Most nights I'm lucky if I can just wash my face and use my eye cream and moisturizer, can any other mama relate?! So it's really important to me on self care nights to go the extra mile with my skincare routine and really treat myself! The other day at CVS I was shopping for Christmas decorations and came across Aveeno®'s new Aveeno® Positively Radiant® collection. I love how CVS is such a convenient one stop shop for everything I need from Christmas decorations to all of my favorite beauty and skincare products. 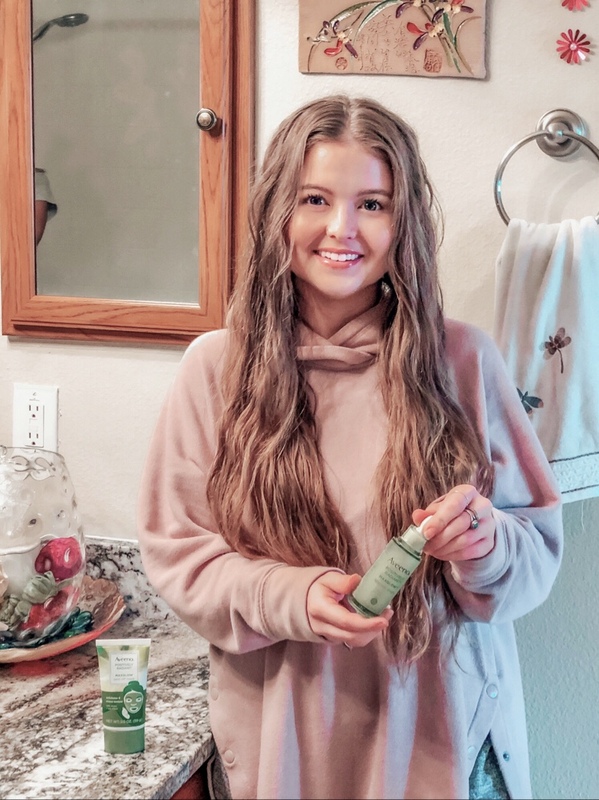 I've been a huge fan of Aveeno® for a long time and decided to try their new collection that's designed to enhance your skins natural radiance giving it a lit from within glow. I mean, who doesn't want that?! The soy enriched products target tone and texture which is exactly what I have been looking for recently! I decided to incorporate the Aveeno® MaxGlow Peel Off Mask into my bath routine. I applied an even layer of the mask to my clean skin, avoiding my eyes and hairline and left it on for the 20 minutes I was in the bath. The mask became more and more transparent as it dried down and was really easy to peel off once I was out of the bath. I love that it is specifically formulated with alpha hydroxy acids and a soy and kiwi complex to help hydrate the skin. After peeling off the mask, my skin looked smoother with a more even tone and texture overall! I'll definitely be using this mask once or twice every week from now on. As a tip, when using products with alpha hydroxy acids, make sure you always wear sunscreen when you will be out in the sun after using them for up to a week post use. Alpha hydroxy acids can increase your skins sensitivity to the sun and possibly increase your risk of sunburn. They are amazing for your skin, but it is important to be aware of that! I also love that this formula is gentle for sensitive skin and paraben and phthalate free! While laying in bed watching my favorite show, I like to write down 3-5 things that I am grateful for that day and snack on popcorn and chocolate chips, my favorite indulgent snack! Writing down what you're grateful for really helps you to appreciate what you do have in life and helps promote joy and happiness. Right before getting into bed I added the Aveeno® Positively Radiant MaxGlow Infusion Drops in to my skincare routine. The infusion drops act like a serum but can also be added to your moisturizer if you'd like. I took 2-3 drops in the palm of my hand and smoothed in into my skin before applying my moisturizer. I love that they are moisturizing drops that help to even the tone and texture of your skin giving it a hydrated and dewy appearance as you can see from my photos! These drops are uniquely formulated with a soy and kiwi complex to help attract and lock in moisture on the skin. I can tell you my skin felt so soft and hydrated after using these which is saying a lot because I have extremely dry skin! A little self care can go a long way and really rejuvenate you for the rest of your week. Around the holidays I know it can be even harder to carve out some "me-time" but trust me you will be so happy you did! What's one of your favorite things to do on your self care nights? !